Flexible and water repelling, self cleaning top coat plaster, with grain size of up to 4mm. It contains new age, flexible and water repelling resins. Offers complete water repellency per DIN 18550, high flexibility, unbreakable adhesion, unblocked breathability as well as complete water vapour permeability. It does not favour mold creation on its cured surface, while it does not absorb atmospheric pollutants. It does not crack like regular plasters do and it corrects surface defects, up to 8mm per coat. It can be applied over cracked marble based (but sound) plasters. Easily applied by either hand or plastering machine. 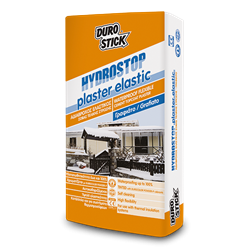 It participates in the certified external thermal insulation system of buildings, THERMOSEAL of DUROSTICK as plastering top coat. Certified per ETAG 004 (Class 1) from the notified european organisation OIB, with certification numbers ETA-13/0006 and ETA-13/0007. Environmentally friendly. Classified GP: CSIII/W2 per ΕΝ 998-1.